Thank you letter for a gift of $1,000. Miss Berry also discusses her "silver wedding with the Berry Schools" and invites Miss White to visit the schools. 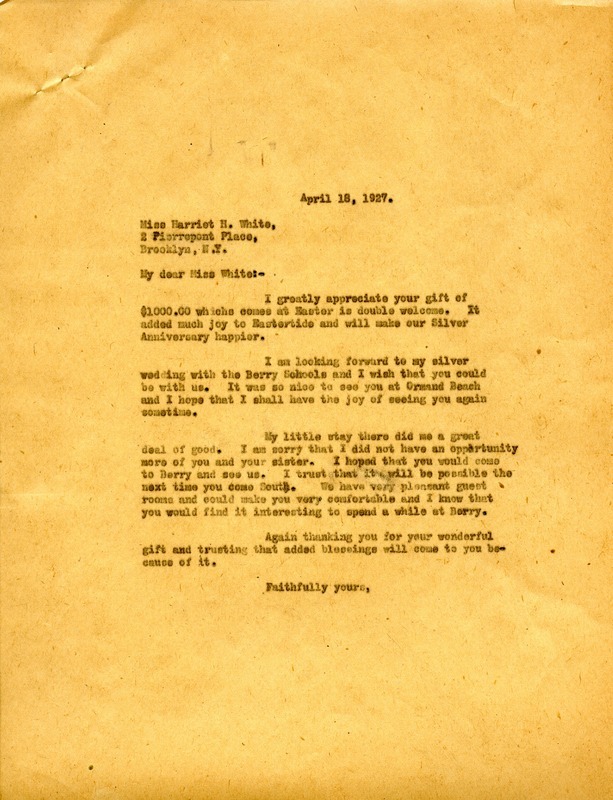 Miss Martha Berry, “Letter to Harriet H. White from Martha Berry.” Martha Berry Digital Archive. Eds. Schlitz, Stephanie A., Rachel Renaud, Chelsea Risley, Allison Moore, et al. Mount Berry: Berry College, 2012. accessed April 26, 2019, https://mbda.berry.edu/items/show/6200.